The grooves on the chewing surface of the teeth create favorable conditions for the development of dental caries. 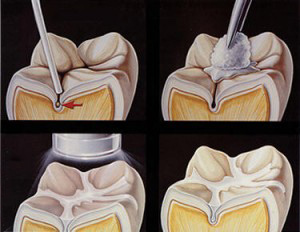 With the filling the grooves of the teeth are closed, the method is used to prevent tooth decay, keeping in mind the conservation of the tooth. Shortly after the tooth eruption,decay may begin, so the last decades, they raised the idea that a good solution would be to seal the grooves of the teeth and dimples properly with a good adhesive material. After that the bacteria can not colonize, the surface will become easy to clean, thereby providing protection against tooth decay. Its significance is primarily in to close the tooth cavities of children with proper oral hygiene. 1. From the patient part thorough brushing. 2. The enamel acid etching to remove the upper part of the enamel, making the enamel surface to increase, and this creates favorable conditions for the sealant material to be bound. 4. The application of sealant material: the goal is to close the groove to the full dept.